What it feels like to be a UBC Mech Eng grad student. Yes, it’s true. It’s a tree (apparently, it is a douglas fir tree). And yes, that’s my planter at home and I named it something that makes it super easy for me to remember what kind of tree it is — because, I almost forgot within the matter of three minutes. 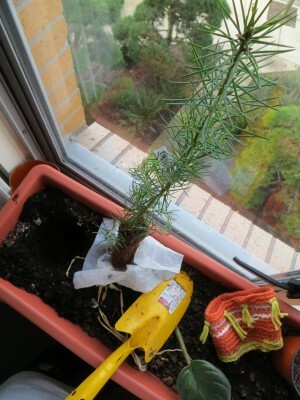 Douglas came home with me today, because I participated in ‘plant a tree’ activity to celebrate the International Day of Forests. [o]n each International Day of Forests, countries are encouraged to undertake local, national and international efforts to organize activities involving forests and trees, such as tree planting campaigns. So I figured I’d do my portion of raising awareness of the special day by talking about it. As usual, I woke up bright and early this morning, and got ready for my morning teleconference meetings starting at 8am. I have lots of interesting roboethics things going on lately, so my mornings have been filled with roboethics for the past couple of weeks. After the meetings, I head out the door and started walking along the usual path I take to the lab — through the Forestry building. There was a booth set up inside the forestry building where a group of students from the Forestry Graduate Student Society were wrapping small little evergreen trees. While certainly being aware that I’m walking through the forestry building — lots to do with tree there — I was curious why these little trees were being wrapped up. As I cautiously approached them, being highly hesitant what to do, one girl came up to me saying “Would you like a tree?” and handed me Douglas. Are you kidding? Would I like a tree? Of course, I’d like a tree. I actually have a thing for trees. My favourite word in the world is tree in Korean. In a sort of warm and nature-loving way, I think trees are awesome. To me, they are like these mystical creatures that symbolize slow yet continual growth, perseverance, strength, and something friendly and happy in general. But as though being handed a puppy to raise in my residence, my first reaction was a mixture of “yay~!”, “what do I do now?”, and “how big is it gonna get?”. I asked the lady where I should plant it, and she simply said “anywhere!” with a big and confident smile. 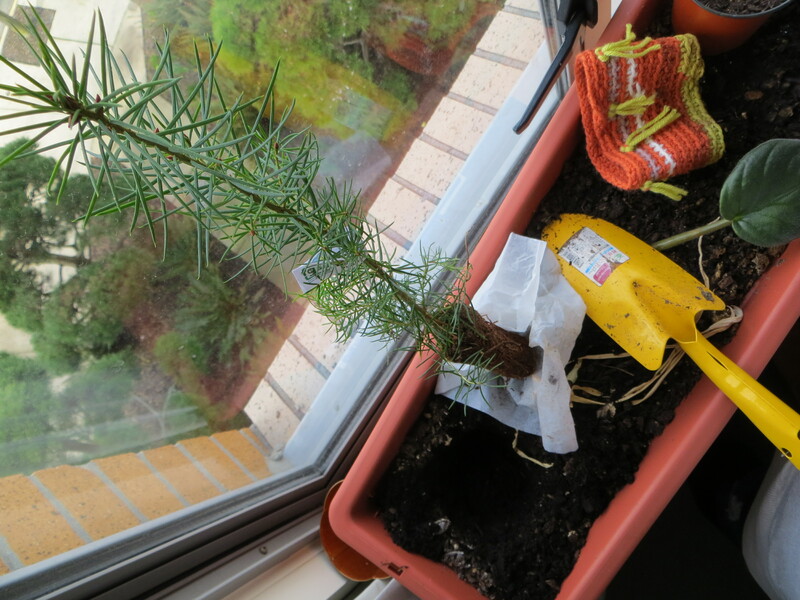 I’m sure she’s studying Forestry, so I assume that she knows what she’s doing in handing me the baby tree to take care of with such simple instruction as ‘plant it anywhere’. So I did. I am sure the idea is to build, protect, and foster forests, and my planting of the tree at home probably isn’t very helpful. 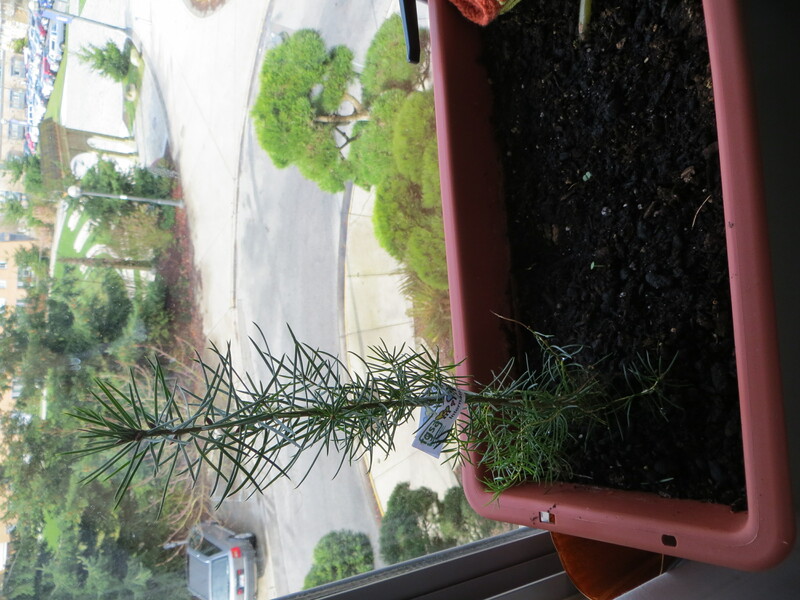 But maybe, if I can take a good care of it for the rest of my PhD career, Douglas will grow to be a strong little tree with a sense of character and healthy attitude (yes, I am anthropomorphizing lots here). 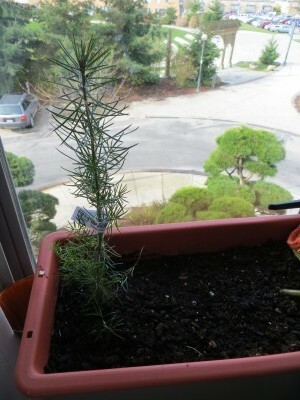 Then I will find a good spot to plant it, and make it a part of beautiful forests of BC. Maybe, as Douglas grows to be taller and stronger, I will grow to be a taller and stronger (not in the literal sense) researcher as well. Anyways, I am glad that the graduate student society is actively participating in their portion of the UN’s initiative. 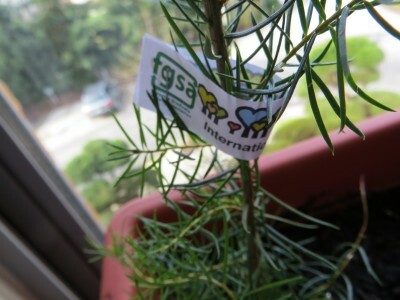 Happy International Day of Forests everyone. I am not sure how long the booth will be there, but I hope you get the chance to drop by the Forestry building today and spend a few minutes planting a tree. This entry was posted in UBC Grads 101 and tagged Forestry, Gardening, Grad student societies, International Day of Forests, Trees on March 21, 2013 by AJung. Housing: Thunderbird vs. Marine Drive, and how much $ for furnishing a studio? That’s right. This is the first post I am writing this year, although it’s already February. As you might have guessed, I recently finished writing my comprehensive exam (a.k.a. comps). You have no idea how happy I am to be typing away on my laptop rather than squeezing my colourful pens trying to write equations in tiniest legible form possible on my cheat sheet. 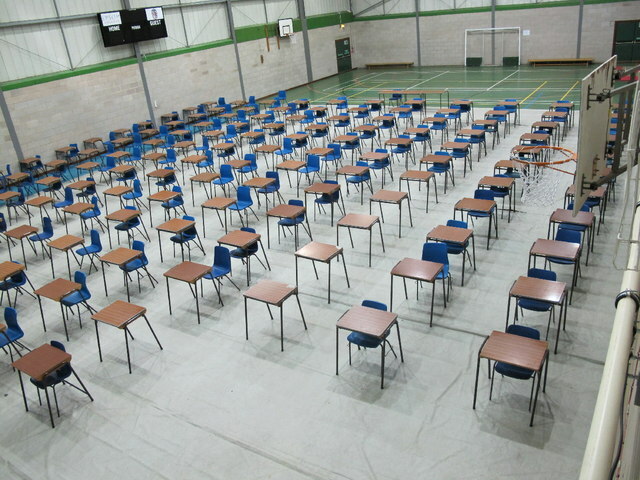 Some of you may have expected my first iMech post of the year to be filled with complaints about the exam. Don’t worry. That’s on my list of upcoming posts, and will be posted probably after I get my results back (fingers crossed!!). Anyways, small talks aside, I actually got a question from a prospective grad student regarding UBC residences. Now, last year I wrote a post dedicated to UBC housing, but the question from the student made me realize that the post isn’t really helpful when you’re trying to figure out how much you should budget when thinking of moving to campus (in to a studio or a one-bedroom unit where you have the freedom to furnish your own place). I can’t speak for other students, because everyone has different standard of living, and budget in mind. But if you’re thinking about budgeting in the first place, that probably means you have reasons to worry about your finances and belong to the group of most of the grad students I know. If that’s the case, then maybe my story will help — and you might be surprised to find how cheap it is to furnish a place if you just take the time to chill and look around. So here it is Student J. This post is for you. When I was looking into housing for coming to UBC, I had no idea I was supposed to apply for residences way in advance (like now). So I started looking into it around June or July I think, which meant that I’d be put on the waiting list along with thousands of other students who are also on the list (and ahead of me). I decided that it’s not worth waiting for thousands of rooms to free up so quickly, and resorted to a more convenient route. A family friend of mine who was living in downtown Vancouver was moving back to Toronto and wasn’t too keen on taking all her furniture with her. So I conveniently took over her lease and had all the necessities (bed, table, microwave etc) all set up for me when I arrived in the city. That wasn’t the most affordable solution in terms of rent, mind you. But it was definitely affordable in terms of furnishing the place since I didn’t have to furnish it. When I moved out of the place, of course, I sold the furniture for her so that she didn’t have to fly back to take care of her stuff etc. So it kinda worked out for both of us I think. I had applied for Thunderbird residences back then and was put on the waiting list for about half a year to a full year before I got an offer. And of course, as soon as the offer came in, I moved in to the campus housing. The reason why I had applied for Thunderbird, and not keen on Marine Drive (MD) was that I wanted to live in a studio unit. I’m a really independent person with an interesting daily schedule. So I didn’t want to deal with the whole roommate issue when I take showers at 6am in the morning etc. If you look at the monthly rent for studio units, Thunderbird gives you the most affordable option with larger square feet per unit. While MD studio units may be located at a place overlooking the ocean and comes furnished, it costs a lot more ($965.13/mth for a smaller unit, $1,043.97/mth for larger unit) than Thunderbird studios that don’t come furnished ($855 – $924/mth depending on type of studio you get). Mind you, these rents go up every year, so be sure to check the official website for the latest info (http://www.housing.ubc.ca/residence-fees). Had I wanted to have roommates, Marine Drive’s 4 bedroom units ($~800/mth/person) would’ve been my first choice. Thunderbird residence’s 4 bedroom units ($670/mth/person) tend to be less well maintained, in my opinion, and the residence community seems to be much less lively than that of MD. It’s to the level that the amount of money you pay extra to be at MD is kinda worth it. Unless you have a few people you’d like to be roommates with, I’d say go for MD if you’re thinking about having strangers as roommates. That’s totally my opinion based on my visit to friends’ places etc. Now, since Thunderbird’s studio and one-bedroom units do not come furnished. So I practically moved in to an empty house. Luckily, again, one of my labmates at the time was finishing up and was looking for someone to take over his furniture. He had sold a lot of his furniture already, so I got what was left over for free (yes, $0) — an IKEA desk, a chair, a bed frame, and a couple of side tables. But you can probably imagine that that’s not enough to make a cozy ‘get-away from the lab’ environment necessary for grad students. The best thing is though, that once you have a place, it doesn’t really matter if you have it furnished right away. As long as you have your blankets and cooking supplies with you, you can live in an empty house for quite an extended period of time. Luckily — again — one of my supervisor was keeping an eye out for me since he knew that I had just moved in and was looking to furnish my place. After perhaps a few days or weeks (I can’t remember) of living in a barely furnished one-bedroom residence, my supervisor found out that his neighbour was practically throwing away furniture because the elder lady who owned the house had passed away and the house was being torn up for renovation. So, with his help, I brought a couple of my labmates over to the place and got a pull-out bed type couch, two loveseats, a chair, a mattress, and other stuff I can’t remember. I moved out of the one-bedroom place to a Thunderbird studio unit ever since, but most of the furniture I have is from the previous neighbour of my supervisor and my labmate. I think the only additions I have from then is a desk drawer I got from another grad student for $5, another chair I got for free from a friend, an IKEA coffee table I spent maybe $30-60 on (’cause it’s the only thing I bought brand new), a $20 kitchen table, and the bench I purchased last Fall. So, I pretty much furnished my place with essentials without costing me anything — I could’ve just gotten a coffee table from someone for $5 instead if I wanted as well. Now, you are probably thinking, it’s a new city and you don’t really know anyone here. 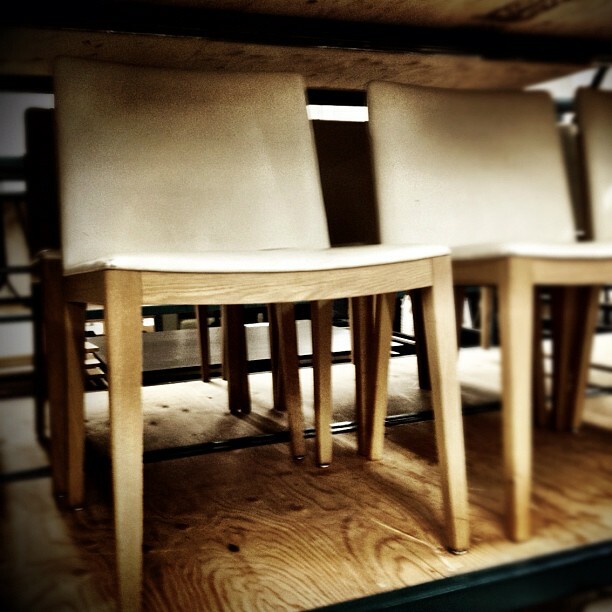 So who’s going to be looking an eye out for you to help you get free furniture? Even if you don’t know many people here, I don’t think it’d really cost you much money to furnish your place. It’s more of a hassle to furnish it, than it is a drain on your bank account. That’s because most students don’t have a car, and hence think they can’t pick up that free furniture someone is giving away. But if you sign up for Zipcar or other car co-op, and have a valid license, then you can rent out trucks by the hour (about $12/hr or something usually) and can make it work. The key is to not worry about furnishing your place all at once. Get what you can, when you can. And monitor Craigslist and Kijiji often. Because there’s always someone in Vancouver who is giving away all their furniture for free or for a couple of hundred $ but those deals go quickly. When you go to these people’s places and buy out their furniture, they’re more than happy to throw in a side table, a lamp, a whole rack of dishes and cups. These people really want to get rid of them asap than to make money off of them. Students often move from places to places as well and most of them would hate to have to throw the furniture out on the curb of a road. They’d rather someone take it off their hands for free. 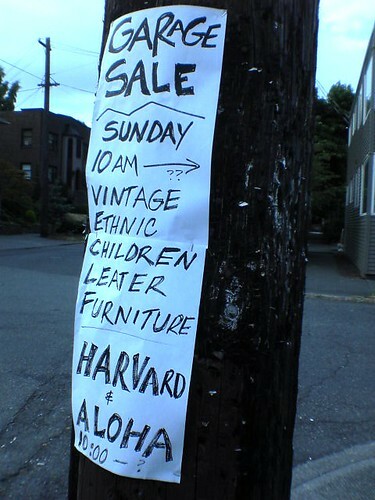 This makes furniture easy and cheap to find. One key ingredient for student furnishing is to have good set of friends though. Be good friends with your labmates or roomates or residence mates. Because when you’re trying to get that free couch out of a stranger’s place, there’s nothing like a couple of extra hands to help you out. If you can afford to spend more money than just a couple of hundred bucks to furnish your entire place, then IKEA is a student’s friend. But IKEA is actually kind of hard to get to without a car, nevermind the fact that you’d have to carry huge load of stuff back with you or pay for delivery. If you are keen on furnishing your place with IKEA furniture, but not necessarily looking to get brand new furniture, then I’d say walk around campus a bit whenever you have time. Because the boards and elevators and laundry rooms are full of flyers that say “all must go by Tuesday” or “$100 for everything” etc. This entry was posted in All about Vancouver, Finances, Housing, UBC Grads 101 and tagged Do it student style, Housing, Residences on February 3, 2013 by AJung. I am fully aware that the title of this blog has nothing to do with cookies, or cookie recipes. But I am going to start with a cookie talk. Don’t worry. It’ll all make sense in a minute. So, after my last post, I was tempted to actually try baking a cookie. I’ve never successfully baked a cookie before (well, the ones where I bought the frozen cookie dough and threw in the oven turned out awesome but those ones don’t count). So I figured I’d give it a try today as a practice run for the upcoming holiday season. I’m probably going to be celebrating the awesome holiday festivities with my friends in Vancouver, which means I’ll be baking and cooking on Christmas Eve and consuming much of it during and after the cooking/baking process. I picked the simplest and the easiest recipes from the link I sent out on my earlier post, and used my very new and shiny cookie cutter to make star shaped cookies — actually, I had to go to a hardware store today and was tempted to get a cookie cutter, which probably tempted me to bake cookies today more than anything. Due to my lack of following directions on the recipe, it ended up taking longer than I expected, but it was a success. 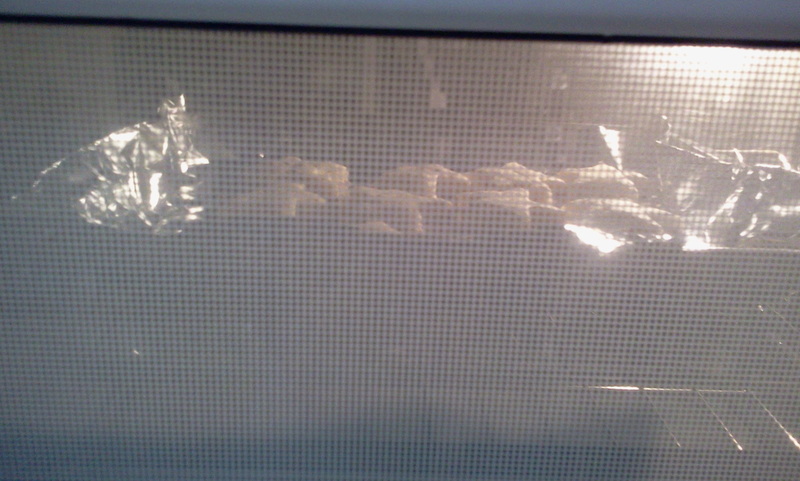 Baking cookies is one of the new things I’m trying out these days. Last year, I used to think that I have no time for anything other than getting this robot to work, finish conducting my final experiment, and write my thesis. I think I was stressed almost every day, because I had been fighting this same robot for months and felt that it had been dragging my thesis process for longer than what I felt was reasonable. But this year, it’s different. I am as busy as before, but much less stressed than I was last year. One of the reasons, I think, has to do with the fact that I’ve started to manage my time better. And with my Project Healthy Daily Routine that started about a month ago, I have been able to find the time to try new things as well as appreciate the old. So, as part of my efforts to stay productive, I kept up with my daily routine I’ve set up for myself since the beginning of November. With this routine, I go to bed at 10:30 everyday (weekends are kinda odd, but that’s ok), wake up at 5:30am, do yoga or other morning exercises at home for about half an hour to an hour, shower, and then start my day. The first week of trying was kind of rough. As I mentioned in my previous post, my hour of real work per day used to go all the way from ‘terrible (14% of my awake hours)’ to ‘epic (50% of my awake hours)’. I am sure there were worse times, but I just hadn’t noticed it before I started logging my daily schedule like crazy and monitored how I spend my time each day. Considering just the weekdays, I had spent about 27% of my time doing work related stuff. Email is also work related, but I they can often be combined with personal ones, so I don’t count them in. 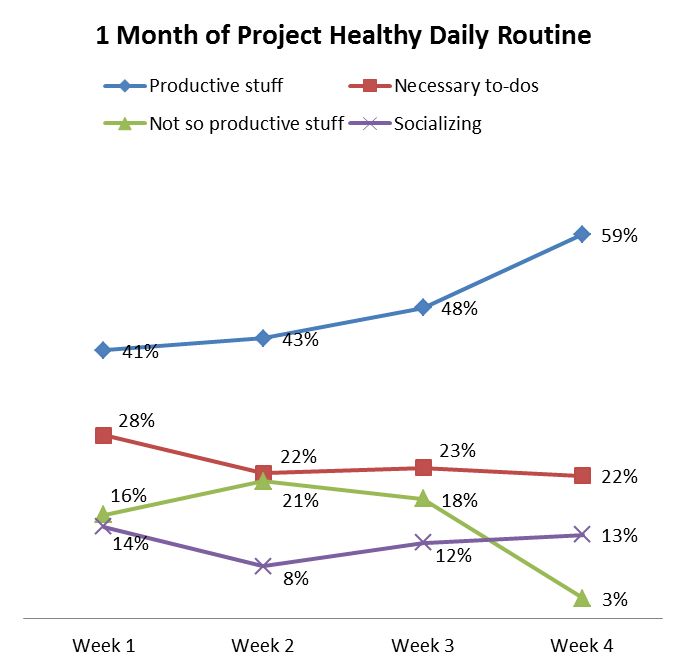 At the end of the second week, I felt much better, but didn’t think that I improved my productivity in any way. The 27% had increased to 30%. But that’s a ‘meh’ kind of a number, because who can say that 3% increase out of 100% is a significant increase (especially when you only have a sample size of one)? Anyways, by the end of the third week. Things were starting to look much better. I did still procrastinate quite a bit, and there might have been and 1.5 hour of ‘get me out of here’ nap time — eh hem — but the 27% had gone up to 35%. Hmm, great that it didn’t go back down to 27%. Hahah.. And then the last week was the fourth week of me trying out the routine. And now the increase in my number of hours spent working during weekday really cannot be disputed. Over the past four weeks, I was able to boost up my work time from 27% to 37%. And yes, I’m bragging, and yes, you might think I’m a bit more of a control freak than you thought a couple of posts ago. But that’s ok. Because the cool part is that I am probably healthier than before — because I actually exercise and eat regularly now — and get more stuff done in a day without sleeping less for it. I mean, grad school can be one of those places where your self-discipline is really put to challenge. You might have weekly, biweekly, or monthly progress meetings with your supervisors. For some, that means you can chill for the rest of the week, or month, and just cram in a lot of work right before meeting with the supervisor. If you are taking courses, or have other things that really keep you busy, then not meeting with your supervisors often, not having clear deadlines, or not having anyone to look over your shoulders is not a problem for you in being productive throughout the day. But if you plan to graduate in/on time, or at least attempt to, while you don’t particularly have other hard deadlines driving you forward, then you really need some strong self-discipline to sit yourself down and get a good chunk of work done everyday. Because grad school, at least the way I am experiencing it, really gives you in charge of your own time and your own pace of work. It provides you with an immense amount of freedom in terms of time and resource to explore, do something you feel passionate about, and actually forces you to dedicate years of your life into exploring that passion of yours. But unless you have a good control over your freedom and your resources, then you might really end up wasting years of your life in many senses that echo the economist article I mentioned a few posts ago. Studying for the PhD comprehensive exam is actually one of the motivating factors for me to monitor my time a little more carefully. Yuki (our department’s dearest grad secretary) sent out an email a couple of days ago, and it’s now official that January 28th is the day that all the first year PhD students in Mech Eng will be sitting in a little room for three hours, writing the exam that might end up kicking them out of their PhD program. So, my theory is that if I don’t really keep up my productivity everyday, I totally won’t have covered my stuff enough to pass the exam. And since we have about two months to study for the exam, the cramming has to be done in a marathon style I think. If I sprint from the start, I will probably burn myself out the last week or something and that’d be bad. I still have some actual research related things to get done this month anyway. Anyways, I’m happy with my progress so far. I also feel kind of strange that I am freaked out, but not so stressed out about the exam — I don’t know if that actually makes sense to you. My mother laughs whenever she asks me how my studying is coming along for the comprehensive exams, because I usually say something along the lines as “I didn’t cover as much stuff as I planned to do but whatever. 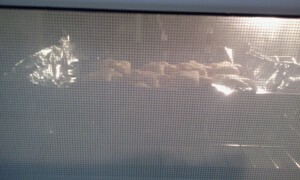 I baked some cookies today though” with a very chill and stress-free attitude. Skimming down my previous posts from this year, I feel like a key theme for me this year has been “AJung’s fight against her workaholic tendencies”. I hope I’ll have a bigger and better theme for next year as I find my PhD thesis topic, write the exam (hopefully pass it too), defend my thesis proposal, and start my second year of PhD. I’m very much looking forward to 2013. You might think this sounds a little bit like the last post of the year, and it’s probably going to be true. I’m going to be in my marathon mode for the comprehensive exam prep, and probably won’t be blogging until I am done. I’m sure I’ll have much more to say about the exam after January 28th. But until then, I hope you, dear readers, an epic grad school application prep season (if you are applying this year), good luck on final/comprehensive exams (I share your pain, I really do), happiest of holidays (yay! ), and an exciting start of the new year. This entry was posted in Surviving Grad School, Thesis, Comprehensives, Papers, (Rant), UBC Grads 101 and tagged Comprehensive Exam, GKE on December 2, 2012 by AJung.